Since March 2018, 12 Year 9 boys have been working hard on making small changes everyday. The Marginal Gains programme was led by Sean Dirrane of Cosmos Engagement and focused on the ways that these small changes can lead to big results across a range of areas in our lives. The events were organised by Sophie Collins (Leeds West Academy), Chris Hatton (University of Leeds) and Lauren Cobb (Leeds Trinity University) using funding from Go Higher West Yorkshire. The programmes started with a launch event back in March, which saw the students take part in a number of activities, both individually and in teams; the activities demonstrated the foundations of Marginal Gains. The students have then worked closely with Sean in the classroom to set goals, manage their expectations and monitor their achievements. Photo: (L-R) Jamie Peacock, Sophie Collins, Rob Burrow, James Bowling. 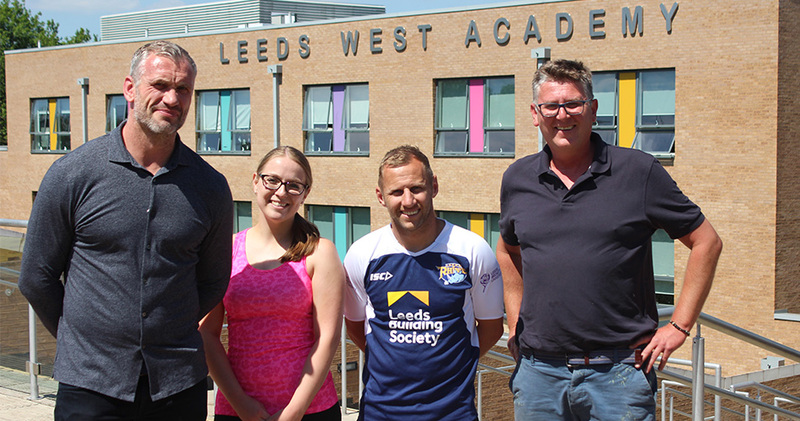 To wrap up the programme, James Bowling (The Squeaker) invited two rugby league legends to work with the students and provide another perspective on Marginal Gains. Jamie Peacock presented his ‘No White Flag’ talk to the whole Year 9 cohort, discussing the small changes that he made in order to improve his performance both during and after his successful career. The students found the speech ‘inspiring’ and ‘it made [us] realise that changes really can be small and still make a big difference.’ There was plenty of time for those who wanted autographs and selfies with Jamie before heading to their last lesson of the day. 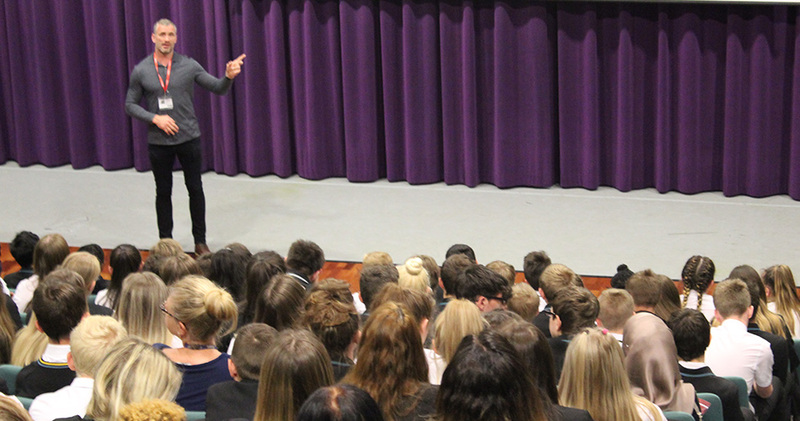 Photo: Jamie Peacock presenting his ‘No White Flag’ talk to Year 9. Following the speech, Rob Burrow led a training camp especially for the 12 boys taking part in the programme. He congratulated them on their focus throughout the programme and training camp and said that they were ‘a great group of lads to work with.’ They worked on ball-handling skills, agility and speed throughout the session, before ending with a quick match. 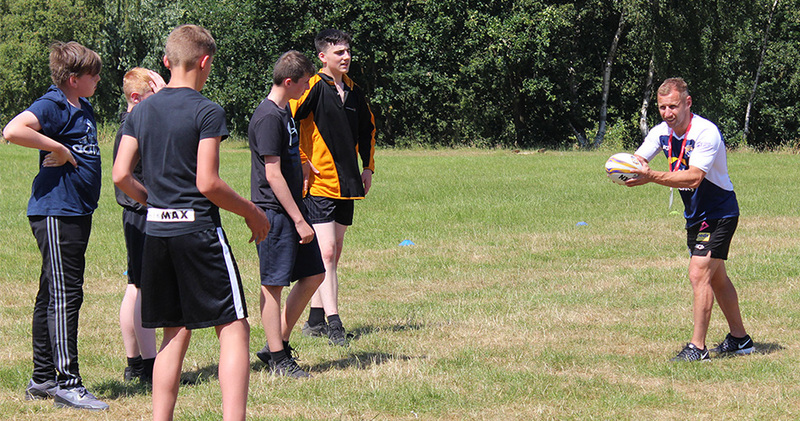 Photo: Leeds West Academy students learning from a rugby master. Leeds West Academy would like to extend great thanks to all who were involved in organising the programme. We have already started to see improvements in different areas of these students lives – whether that be confidence, attendance, behaviour, focus or determination – and hope that we have provided them with the skills to continue making strides.